Wilma Nancy Culpepper, White, Female, married Wilton Miles Bunch in 1923 in Pasquotank Co., NC. Wilma Culpepper Bunch, Female, White, Widowed, born 29 Nov 1903, died 17 May 1993 in Elizabeth City, Pasquotank Co., NC, SSN: 237-03-0337. 1790 Census 2 Aug 1790� Henry was probably a free white male, under 16 years old, in Jean (? )'s household on the 1790 Census on 2 Aug 1790 at Martin Co., North Carolina. Will* 1856� He made a will at Marion District, South Carolina, in 1856, naming as heir(s) George J. Culpepper, Jane Elender Culpepper, Mary Coleman, Robert Benjamin Exum and Mary Catherine Culpepper. Biography* � That this Henry Culpepper of Marion County was from the Martin Co, NC, family is shown by the deeds above as well as bythe following:. Book D, p. 27, 10 Nov 1801, Henry Culpepper of Liberty [now Marion] Co. SC to William Cherry, for £37 and ten shillings, 50 acres on Mill Swamp adjacent to Andrews and Solomon Cherry. Witnesses Roderick Cherry, Solomon Cherry. On 2 Apr 1801, Henry Culpepper of the Marion District of Liberty County, SC, was appointed by Ephraim Burnet of the same place as attorney to receive sums belonging to Burnett at the death of Rebekah Burnet living in Martin Co., NC, which sums will be property left by her grandfather Harod. /s/ Ephraim (x) Burnet, wife Elizabeth (x) Burnet. Wit: Nathaniel Gibson and Varnal (x) Adams. Proved by Gibson before R. Gregg, JP, 13 Jun 1801. Recorded 23 Sep 1801 (Marion Co. SC Deed Book A, pages 186-187). On 12 Jun 1802, Henry Culpepper and Malcom Monroe witnessed the sale by Thomas Knight of Marion District to John Gibson of same place for $900, 885 acres on Peedee River. /s/ Thomas Knight and proved by Culpepper before Francis Wayne, QU, 3 Aug 1819. Recorded 6 May 1820. (Marion Co. SC Deed Book I, pages 236-237). On 30 Aug 1803, Henry Culpepper and John Gregg witnessed the sale by James Hudson of Marion District to Baker Wiggins of NC for $50, 177 acres on N side Willow Creek. /s/ James Hudson. Gregg proved before Thos. Godbold, JP, 24 Aug 1804. Recorded 5 Sep 1805. (Marion Co. SC Deed Book C, pages 139-140). On 16 Mar 1804, William Tucker of Marion District sold for $600 to Henry Culpepper, a planter of the same place, two tracts containing 411 acres on Jeffreys Creek and also bounded by Robert Gleen and Richard Green. /s/ William Tucker. Wit: E. Burch, Jno. Cooper, Jeremiah (x) Brown. Proved by Burch, 20 Aug 1804 before Thos. Godbold, JQ. Recorded 27 Aug 1804. (Marion Co. SC Deed Book C, pages 22-23). On 22 Mar 1804, Henry Culpepper, James Mumford and Wilson (x) Blan witnessed the sale by Charles Barfield of Marion to Joel Bryan of same place for $150, 200 acres of Big Swamp, bounded by Jonathan Shadwick. /s/ Charles Barfield, Luse Barfield. Proved by Mumford before Robt. Gregg, JP, 24 Sep 1804. (Marion Co. SC Deed Book C, page 40). On 15 Feb 1806, Henry Culpepper of Marion District sold to Joseph Causick of Darlington District, SC, for $900, 711 acres on South side of Jeffers Creek and bounded W by Richard Green. /s/ Henry Culpepper. Wit: Saml Blackwell, John McCown, James Lane. Proved by Blackwell before Timothy Dargan, JQ, Darlington DIstrict, 6 Mar 1806. Recorded 25 Mar 1806. (Marion Co. SC Deed Book C, pages 233-234). On 22 Feb 1806, Henry Culpepper of Marion District sold to David Harrel of same place for $500, 125 acres on middle branch SW side of Great Pee Dee River. Original grant of 6 Aug 1787 to John Porter. /s/ Henry Culpepper. Wit: Thomas Finklea, James Holland. Proved by Holland before Robert Gregg, JP 21 Feb 1806. Recorded 3 Mar 1806. (Marion Co. SC Deed Book C, pages 221-222). On 1 Jan 1807, Henry Culpepper was paid by Administratrix Mary Mathew in connection with the settlement of David Perkins estate. (Roll #666). On 2 Jun 1810, Henry Culpepper and Samuel Thompson witnessed the sale by John Burnett, Jr. of Marion District to Turner Bryan of same place for $1000, 397 acres on Jeffries Creek. /s/ John Burnett. Proved by Culpepper before R. Gregg, JQ, 27 Jun 1810. Recorded 2 Jan 1812. (Marion Co. SC Deed Book F, page 18). On 7 Mar 1810, Henry Culpepper purchased from the estate of Peniah Savage. (Roll #705). On 4 Oct 1810, Henry Culpepper and Mark Done(?) witnessed the sale by Lemuel Bryan of Marion District, planter, to Jane Ballentine of same place for $50 a tract bordering Charles Barfield. /s/ Lemuel Bryan. Proved by Culpepper before Robert Gregg, JQ, 6 Oct 1810. Recorded 15 Oct 1810. (Marion Co. SC Deed Book E, pages 223-224). On 15 Feb 1811, Henry Culpepper was one of the purchasers from the estate of William West (Roll #803). Following the death in Nov 1811 of Dr. Samuel Killburn, both Henry and James Culpepper purchase from Dr. Killburn's estate. (Roll #435). On 4 Mar 1815, Henry Culpepper, Willis Day and Robert Hudson witnessed the sale by William Alsobrook of Marion District to Edward & Joseph Burch for $900, livestock and slaves. /s/ William Alsobrook. Proved by Day before Turner Bryan, JP, 10 Jun 1815. Recorded 22 Jul 1815. (Marion Co. SC Deed Book F, pages 278-279). On 5 Oct 1818, an Alias Bond for Henry Culpepper in connection with the estate of Martha Pittman, administered by Turner Bryan. (Roll #462). In Feb 1823, Henry Culpepper was an appraiser for the estate of Daniel Stone and subsequently purchased from it. (Roll #715). In Oct 1824, Henry Culpepper was named an appraiser of the estate of Jesse Staten and subsequently purchased from the estate. (Roll #704). On 5 Feb 1827, Henry Culpepper was granted letters of administration for the estate of Bryan West. (Roll #809). Circa 1828, Henry Culpepper purchases from the estate of Jeremiah Brown (Sales Book A, pages 63-65). 1 Sep 1829, Henry Culpepper paid 50 cents ferrage, 1 day, for 24 miles back & forth to court in response to subpoena. 1 Sep 1838, Henry Culpepper paid 25 cents ferrage for riding 17 miles to court for 4 days attendance in response to subpoena. On 3 Dec 1836, H. Culpepper was an appraiser of the estate of Dotson Stone (Roll #718). On 14 Jan 1839, Henry Culpepper was one of the purchasers from the estate of Leonard G. Smith (Roll #741). George Culpepper, 21, M, Marion District, SC. Jane Culpepper, 1 M<16, 1 F, 1 Free. Henry Culpepper, page 134, 1 M26-45, 1 F26-45, 1 F45+, 1 slave. Henry Culpepper, page 57, 2 M0-10, 1 M26-45, 1 F26-45, 0 slaves (ID: 1365). Lucille Utley, compiler, Marion Co., SC Extracts from Equity Rolls, Hemingway, SC: Three Rivers Historical Society, 1981, Repository: SC Archives and History Center in Columbia. Lucille Utley, compiler, Marion Co., SC Abstract of Deeds, Vol 1, Books A-E, 1800-1811, Charlotte, North Carolina: A.W. Sutcliffe, 1996, Repository: SC Archives and History Center in Columbia, Call No. F277.M2 U85 1996.
pages 18, 57, 60, 74, 83, 85, 161, 163. Lucille Utley, compiler, Marion Co., SC Abstract of Deeds, Vol 2, Books F-I & K, 1811-1823, Charlotte, North Carolina: Forebears Press, 1907, Repository: SC Archives and History Center in Columbia, Call No. F277.M2 U85 1996.
pages 3, 45 and 135.
pages 29, 127, 257, 258. Lucille Utley and Danny Smith, compiler, Marion Co., SC Probate Records, Vol. 2, Hemingway, SC: Three Rivers Historical Society, 1985, Repository: SC Archives and History Center in Columbia, Call No. F277.M2.U51. pages 16, 24, 51, 52, 56-57, 59, 73-74, 122-123, 125, 221. Lucille Utley, compiler, Marion Co., SC Court Records, Court of Common Pleas, 1788 to June 1861, Hemingway, SC: Three Rivers Historical Society, 2002, Repository: Hartsville SC Genealogical Research Library. On this Twenty Eigth day of November in the year of our Lord Eighteen Hundred and Fourty. - That she is the widow of Robert Coleman, who was a Sergeant, during a part of the Revolutionary War - afterwards a First Lieutenant under Captains Simonds and Witherspoon. - That her husband entered the service of the United States by enlistment at the commencement of the Revolutionary struggle, and continued in the service until the close of the war. - That her husband was a resident of this State and District when he entered the service. - In several skirmishes with them, particularly in one at Bass's Mill on the Great Pee Dee River where he lost a valuable horse, the Whigs (Patriot colonist) were commanded there by (?) Murphy (probably Capt. Malachi Murfee who is reported as wounded there). - That her husband was also in the memorable Battle of Fort Moultrie near Charleston and was a Sergeant in that Battle. (Fort Moultrie is located on Sullivan's Island at the mouth of Charleston harbor. Battles record are: 6/28/1776 (first major victory of the war), 6/8/1780 (huge defeat of the war when Charleston fell) and 5/12/1781). - That he was one of Marion's Riflemen, often sent into the little Pee Dee Country after the Tories. - That he served too in the army of General Marion under the immediate command of Captain Snipes. - That her husband was discharged for faithful service but that it is lost or mislaid. She further declares that she was married to the said Robert Coleman on the 14th day of June the year Seventeen Hundred and Seventy Seven. That her husband the aforesaid Robert Coleman died on the Twenty Second day of February Eighteen Hundred and Twenty Five and that she has remained a widow ever since that period (guess) as will more fully appear by a Reference to the proof here to annexed. Source of the following: Jim Coleman, Huntsville, Ala., as sent to COLEMAN-L@rootsweb.com, September 2000. His source was: James P. Colemans, The Robert Coleman Family, from Virginia to Texas, etc., pages 438-439. Robert Coleman, a resident of the District of Marion, S.C., when he entered the service under Captain N. Simonds and Witherspoon, in General Marion's command. He was in several skirmishes, one at Bass's Mill on Gread Reeder River against the Tories. Also served a tour guarding the Tories. He was also in the Battle of Fort Moultrie, near Charleston as a Sergeant in Marion's riflemen, later a 1st Lieutenant. June 14, 1777 Robert Coleman married Prudence. (Her maiden name not given). The soldier died February 22, 1825 (or May 22, 1825). Both dates given. On November 28, 1840, Prudence Coleman, widow of Robert Coleman, filed for a pension on the service of her husband. The widow was a resident of Marion District, S.C., near Lynches Creek. she was at the time 84 years old, "since 28th of August." The "SCOTT" idea for Prudence's maiden name may come from the name of one of her sons...John "Scott" Coleman born 1808 in Marion District, SC...just an idea..
E-mail written Nov 2008 from Susan Martin, sgmartin05. Robert Exum, executor of Culpepper estate, 9 slaves: 1 F35, 1 F18, 1 M16, 1 F13 , 1 M8, 1 F8, 1 M6, 1 F4, 1 M4. Mary Culpepper, 50, F, Farmer, $250/$2000, SC. M. Culpepper, 75, F, SC. Polly Culpepper, Other, F, Wid, White, 86, SC/SC/SC. Rebecca Culpepper, 4, F, SC. W. W. Sellers, Esq., "A History of Marion Co., SC", Southern Historical Press, Greenville, SC 1996 (Originally published Coulmbia, SC, 1902). G. J. Culpepper, Company H, 8th SC Infantry, Lieutenant. Elizabeth Culpepper, 6/12, F, SC. Included were G. J. Culpepper, Prince Culpepper, H. B. Exum and R. B. Exum. Page 233. Cites Roll 1336. "The Darlington Herald", 13 Jul 1894. Ethel B. Isenhour group sheet, Ethel B. Icenhour, Palatka, FL, to Lew Griffin, 1990. "The Marion Star", Marion, SC, 19 Jun 1878: "Died May 9, Mrs. Jane E. Exum, consort of Robert B. Exum, aged 52 years and 11 days. She was the daughter of the late Henry Culpepper of Marion Co."
E-mail written 2002 to Lew Griffin from Bob Bullock. 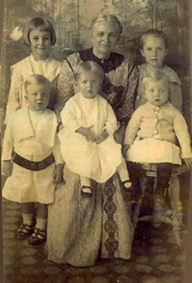 With Mary Rebecca are some grandchildren: Top left: Edith, Top right: Earl, Lap: Margaret. All E. M. Bullock's children. Front left: Will Howell, Stool: Robert Gray, sons of Robert Frank Bullock. 1. Edward Menninger Bullock, born 11 Aug. 1873, He contacted typhoid fever and died 12 May 1921 in Nashville GA. He married Bessie C. Unknown, born 21 Aug. 1878, died 3 April 1970, Nashville GA.
2. George Eli Bullock, born 13 Nov. 1875, died 13 Dec 1955 in Savannah GA.
4. Martha Jane Bullock, born 27 Sept. 1878, died 20 Jan. 1881 from burns received while standing to close to the fireplace. 5. Robert Franklin Bullock, born 4 April 1880, died 14 Feb.1958, Dover FL. He married 27 Dec 1908, in Clinch Co., GA, Effie Della Fender, born 20 Oct. 1883, Clinch Co. GA.
6. Mary Elizabeth Bullock, born 15 Oct. 1882, died 12 Feb. 1968 in Pamlico, SC. She married Louis Alexander McWhite. 7. Charles Walter Bullock, born 14 Sept. 1884, died 28 May 1969 in Nashville GA.
8. Thomas Luther Bullock, born 28 Feb. 1887, died 14 Jan. 1960 in Nashville GA.
9. Ella Lulu Bullock, born 30 Sept. 1889, died 14 Oct. 1979 in Nashville GA. She married H. M. Watson. 10. Annie Bertha Bullock, born 4 March 1891, died 28 Dec.1988. she married Edgar Griffin. 11. Pearl Pink Bullock, born 4 March 1895, died 25 Jan. 1975 in ft Myers, Fl. Buried in Nashville GA.
12. Allen Culpepper Bullock, born 11 March 1897, died 6 Jan. 1981 in Houston TX. Buried Auburn Maine. At his death, William had one surviving brother, Allen C. Bullock of North Carolina. Margaret Spruill Culpepper, White, Female, married Warren H Jennette in 1919 in Pasquotank Co., NC.